Oakland's model W-14, with its slightly medieval look, photographed in Walnut Creek's Walnut Grove when it was new, in 1968. Walnut Grove Eichler owners Scott Brignoni and Scott Turner at their Model W-14. 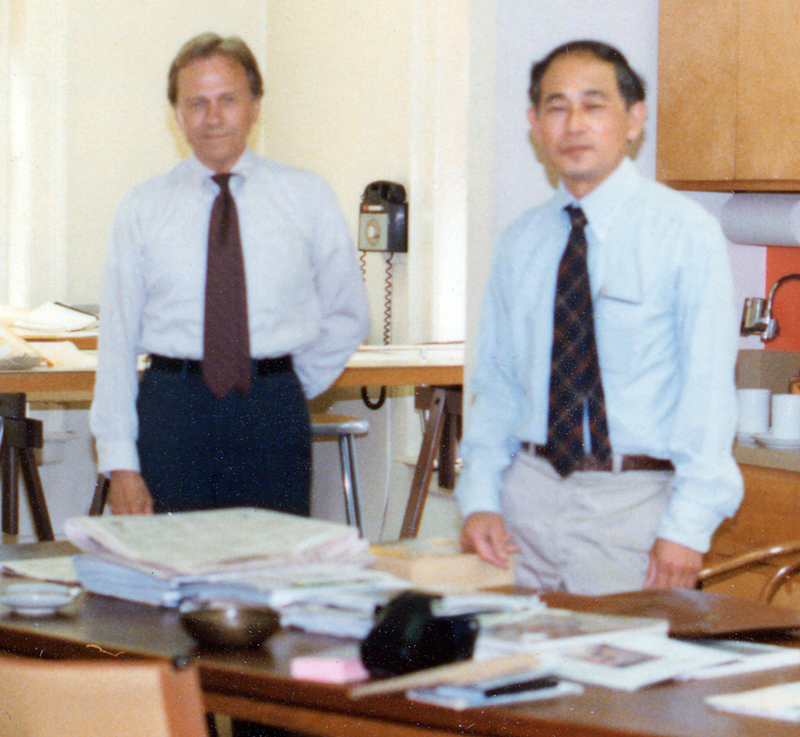 Claude Oakland with partner Kinji Imada, 1976. It's worth noting that many of Claude Oakland's later Eichler models were considerably larger than the typical earlier Eichlers. 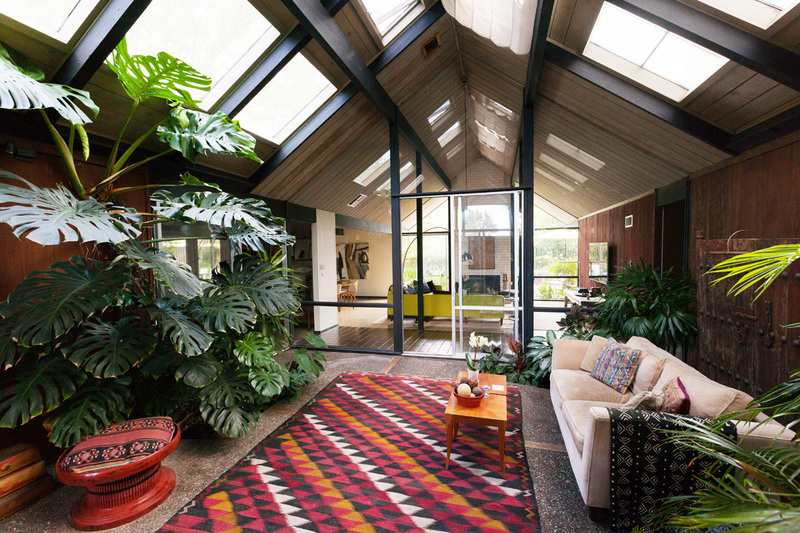 And, unlike in the early days, Eichler himself was more than willing to revamp designs to meet individual desires. The brochure for the all-Oakland-designed Fallen Leaf Park in Los Altos from 1968 brags that "modifications of these plans are permissible. You may choose one of these or select another plan to be built on an available lot, or have a custom home designed to fit your special needs." It's hard not to admire Oakland for the verve and, at times, fantasy, of his later models for Eichler. Just consider some of the facades. We've got the models with the immense, dramatic front-facing clerestory glass, like the MC-34 and MC-674 in Lucas Valley, with roofs flared at their ends like a Japanese inn. While some late Claude Oakland facades may suggest the ultra-mod, others evoke rural cabins. 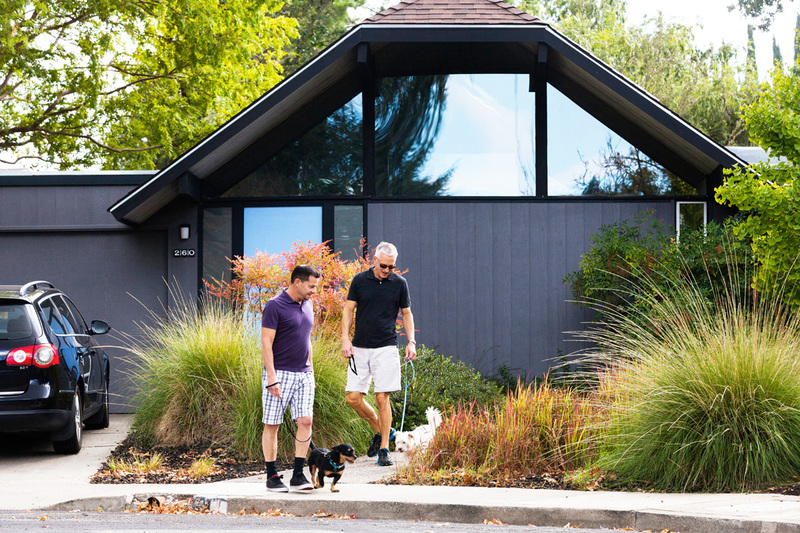 But these 'cabins,' some with shingled hat-like roofs, some with small-shingled gables, for all their evocation of tradition, often conceal some of Oakland's more open, at times almost International Style, floor plans and rear elevations. Looking through Oakland's dozens of late models, one sees a varying arrangement of atriums, galleries, loggias, gardens, and courtyards. Loggias range in size from mere thresholds between atrium and living areas to become rooms in themselves. In the model L-24, from Los Altos, the loggia is as big as the adjacent atrium and serves as another living area between the atrium and an outside courtyard. The result, not unusual for these later houses, is a succession of three more-or-less open-air areas in a row. Another beautiful example of this strategy is seen in both the L-24, and the O-124 from the Fair Orchard tract in Sunnyvale, two designs in which atrium-loggia-court turn the central portion of the house into a series of spaces that are either completely out of doors, or a sheltered extension of the out-of-doors. From the street these two models have similar, conservative, shingled, peaked roofs—making all the more delightful the surprises to be found within. The L-24 is particularly appealing because, in the rear, two mostly glass, almost International Style pavilions stare at each other across a sheltered garden. One houses a living area, the other dining. The contrast between the traditional at the front and ultra-modern in the rear is a delight. As the renamed Oakland & Imada, the firm soldiered on after Joe Eichler's passing in 1974, but, Imada recalled, Eichler had been their major account and his loss hurt. Over the years, Oakland designed much excellent work in a variety of styles for many clients—townhomes, senior housing, high rises, clustered housing, hospital work, and a remarkable concrete home for the structural engineer T.Y. Lin. Still, as Imada pointed out, Oakland was always proudest of what he did for Eichler and never regretted spending so much of his career with him. "He admired Joe Eichler so much, and what Eichler was doing. I think he felt privileged to be able to have done all that." As Oakland's nephew, Stephen Nichols, in a 2005 interview, said, "The notion of bringing those really interesting homes to the middle class was something he was really proud of."